I’m looking for a partner, a partner to chase balls with, share nachos with and maybe even get those matching friendship collars with! After all, I hear it takes two to tango and this Tango really needs a leader. With a little bit of practice I’ll be sure to follow you wherever you want to go, from hiking trails to the warm comfort of your living room, I am your man! 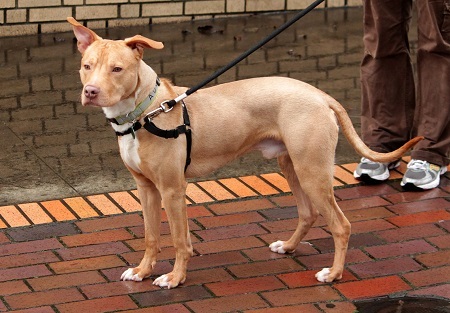 I am an 8 month old Vizsla/Pit mix. Being just a youngin’ following you to puppy classes is a requirement of my adoption. I’ve learned so much already! I’m house and crate trained. I make other doggy and cat friends easily. If you are looking for a confident, intelligent pooch who will love and adore you, then I am just the one. Shall we dance? Fill out an application at pixieproject.org so we can schedule a meet and greet. I am fixed, vaccinated and microchipped. My adoption fee is $220.